Father Paul Ogalo performs rap songs about drug abuse, food insecurity, and the environment at St. Monica Church in Rapogi, Kenya, May 6. 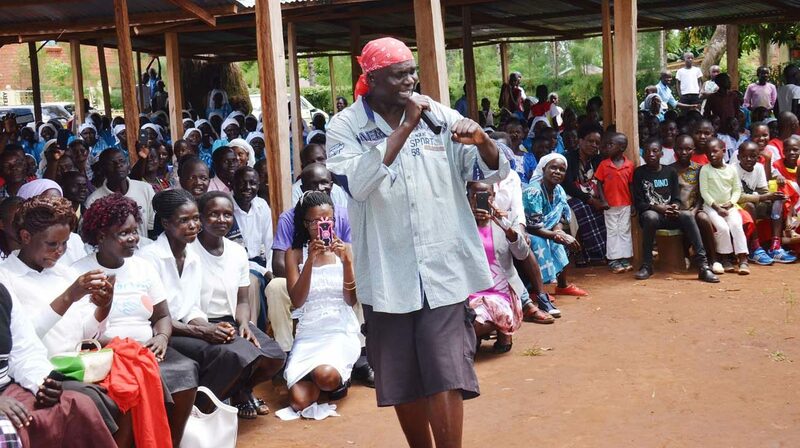 Since then, the 45-year-old priest has been suspended one year by the Diocese of Homa Bay for performing rap after Mass. (CNS photo/Doreen Ajiambo) See KENYA-RAPPING-PRIEST June 21, 2018. RAPOGI, Kenya (CNS) — Many parishioners at St. Monica Church in western Kenya are unhappy after their favorite priest was suspended for misconduct by the Diocese of Homa Bay. A priest in Father Ogalo’s situation “is given time to reconsider his ways. He is mentored by the bishops for some time before he is reinstated. This is a common practice,” Father Kochiel said.